Wishing you could take a mid-afternoon snooze? Propping yourself up with a second coffee by 9am? 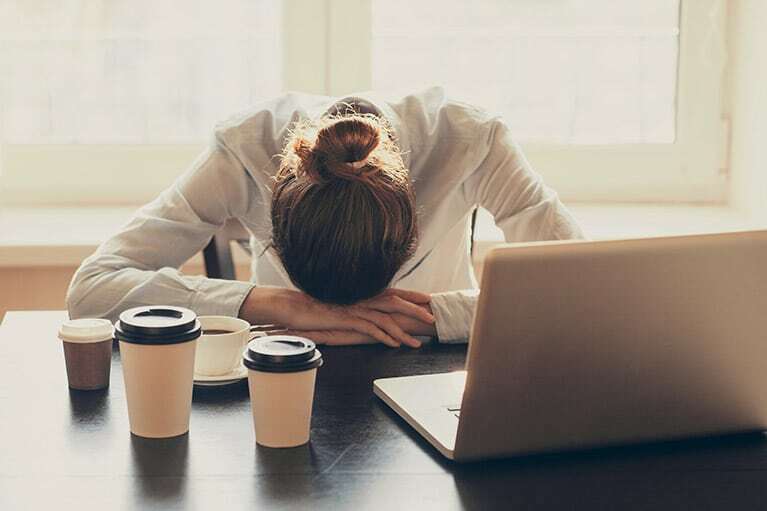 When you feel completely sapped of all energy and want nothing more than to crawl under your desk and take a nap, the last thing you would think of to help you feel better would be to exert MORE energy — but research shows otherwise. Read on as we discuss how exercise can beat that sluggish, too-tired feeling, and improve your mood, too. But it’s not. You’ve probably heard Newton’s laws of motion: “A body at rest stays at rest, a body in motion stays in motion.” It applies to human bodies as well as objects. In fact, studies have proven this to be the case. A study from The University of Georgia showed that even 20 minutes a day of low-intensity exercise can reduce feelings of fatigue by 65 percent. That’s no small claim, especially when an estimated 25% of the general, otherwise healthy but sedentary, population experience symptoms of fatigue. How Does Exercise Boost Energy and Improve Mood? Exercise = Better Sleep = More Energy Regular exercise can improve the quality of your sleep and reduce symptoms of insomnia. Better sleep at night can help you feel more refreshed, focused, and energized throughout the day. Improved Cardiovascular Health = More Sustainable Energy Moderate exercise improves your heart health, giving you more endurance to perform your daily tasks without crashing and burning by mid-afternoon. For improved cardiovascular health, the American Heart Association recommends at least 30 minutes of getting your blood pumping with moderate exercise at least 5 days a week. Improved Strength and Flexibility = Perform Tasks Easier Regular exercise can also improve your overall strength and flexibility, allowing you to perform your daily tasks easier, leaving you more with energy in the tank. Whether it is as “simple” as bending to pick up toys off of the floor, getting in and out of the car, lifting a box of copy paper, or more of a challenge like keeping up with a running child on a playground, loading water onto a cooler, or crawling behind a desk to plug in a new device – daily tasks can wear you down if you have poor mobility and low strength, leaving you feeling fatigued. Better Focus & Mental Engagement A good workout leaves you feeling energized and focused thanks to Endorphins. Endorphins are sometimes referred to as the “feel good” chemical, technically a neurotransmitter chemical released by our brains that trigger positive feelings in the brain, relieving stress and giving a sense of well-being. When you do at least a moderate work out, your brain releases endorphins, leaving you feeling focused and alert, and more prepared mentally to take on otherwise draining tasks. What Kind of Exercise? How Often? Just about any form of exercise that elevates your heart rate will do the job, however it is your frequency, duration and intensity that really matter. If you are completely sedentary, starting small with 10 minutes of moderate physical activity at least 3 times a week is ideal. You’ll want to work your way up to at least 45-60 minutes 3 times a week for the biggest benefit. It is highly recommended if you have been sedentary of an extended amount of time that you first consult with your doctor to be sure your body is in a place where it is safe for you to work out (and that your fatigue is not related to an underlying issue previously unseen), and then consult a fitness professional to make the most of your exercise experience. Elite Training Tulsa can help get you on the right track. Connect with us today to schedule your free assessment and workout!